Relatives carry the coffin containing the remains of Jose Manuel Perez, 28, to his burial site at the Municipal Cemetery in Valencia, on Friday. Weeping relatives arrived at the central cemetery on Friday carrying the caskets of many of the 68 victims who were killed in a police station fire to place them in a freshly dug mass tomb. Cemetery workers said they were prepared to bury at least 32 people two days after the blaze in three-deep graves separated by a layer of cinderblock. They died together when flames tore through an overcrowded police station jail in Venezuela. Now many of them are buried beside each other, too. Weeping relatives lowered caskets of many of the 68 people officials say were killed in one of the nation's worst jail fires into a freshly dug mass tomb on Friday. 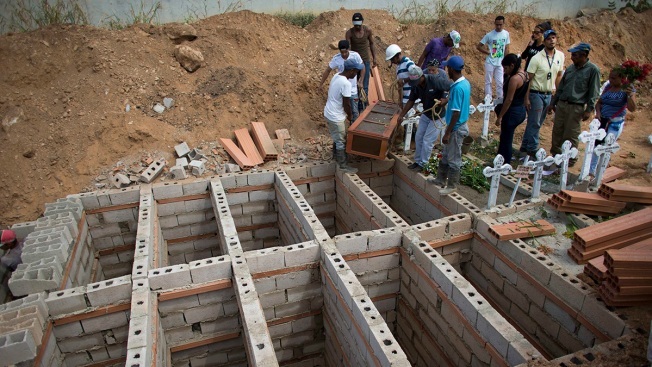 Cemetery workers said they expected to bury about half of those killed in three-deep graves, each separated by a layer of hastily constructed cinderblock. Simple white crosses with their handwritten names, dates of birth and shared death date were put around the tomb. "How am I going to forget seeing my husband burned?" asked Wilca Gonzalez, 36, whose loved one was the first to be placed into the ground Friday. "How can you forget that?" The mass burial comes two days after the horrific blaze in the industrial city of Valencia where an estimated 200 people were being kept in cells meant for no more than three dozen. As they bury their dead, relatives of those killed are clamoring for answers from officials who have yet to release a full account of what happened, state how many were injured or release the names of those killed. "The state is keeping far too silent," said Humberto Prado, director of the Venezuelan Prisons Observatory, an independent group that advocates for prisoner rights. In a statement Friday, the Venezuelan government defended its commitment to human rights and instructed the chief prosecutor's office to investigate. Officials also lambasted the United Nation's human rights office for comments made Thursday urging Venezuela to address concerns like dangerously cramped cells and ensure the nation's jails and prisons meet international standards. "It makes their biased position on Venezuela publicly clear," the statement read. Rights advocates said the relative silence from officials was symptomatic of a larger unwillingness to address long-simmering concerns about the nation's jail system. According to the Venezuelan Prisons Observatory, at least 32,000 people are being placed in police station jails designed as temporary holding cells for 8,000. Inmates are often able to obtain drugs and weapons with the help of corrupt guards. Now as Venezuela struggles with one of the most severe economic contractions in modern Latin American history those conditions are believed to have gotten even worse. Like much of the nation, activists say prisoners are going hungry and unable to get needed healthcare. "With the country undergoing hyperinflation, and the population suffering from mass scarcities of basic goods and medicines, conditions inside Venezuela's penal system have descended to levels that can best be described as draconian," said Geoff Ramsey, a Venezuela researcher at the Washington Office on Latin America. The incident is one of the worst mass casualty events at Venezuelan prisons and jails, but is not the first. A fire at a prison in the western state of Zulia killed more than 100 inmates in 1994. In 2013, 61 people died and over 100 were injured, mostly from bullet wounds, during a riot in Barquisimeto. Absent an official narrative, relatives were left to cobble what little details they could on their loved ones' final moments from photographs passed along from cell phones and survivor accounts. Jeyne Lugo, whose 27-year-old son Roner was killed, said he called her shortly before the fire and said police had shot a pregnant woman at the jail in the head. Inmates then set a mattress on fire to draw attention to the dying woman in an apparent bid to get her aid, she said. He told her that officers then began pouring gasoline, igniting the flames further and causing them to spread. After the blaze Lugo received a photo showing her son's right leg alongside the body of a deceased pregnant woman, her face covered in blood. She recognized her son's leg because of the thick scar running up his calf, the remnant of a surgery he'd undergone after an accident years before. While she said officials have told the families most died from asphyxiation, she doubts that account. According to her, a survivor claims her son survived the blaze but was shot. She criticized what she called a hasty effort by officials to close the case. "I've never seen anything that quick," she said. Other accounts suggest the inmates may have set the fire in an attempt to escape. Carlos Nieto, the director of A Window to Freedom, an organization that monitors prison conditions, said accounts from survivors and relatives indicate the incident began when inmates tried to hold two guards captive. Later they reportedly set some mattresses on fire in an attempt to force guards to open the cells. He said the only survivors managed to escape because firefighters broke through a wall in the back of the cells and questioned authorities for not doing more to help them out. Those inside the jail are believed to have been a mix of inmates awaiting trial or already sentenced for a variety of crimes, many relatively minor in nature. The family of Gonzalez's husband, Erickson Zapata, 23, said he was wrongly jailed with several others suspected of robbing a cellphone. They said he should have been detained for no more than 10 days but instead had been in the jail for 10 months. He was kept in the largest part of the facility where 60 people were crammed inside, many sleeping on makeshift hammocks made from bedsheets. Gonzalez said the last time her husband called her from inside the jail, he was pleading for help. "I can't breathe," he cried. "I'm suffocating." She identified his body by his crooked left ring finger and his uniquely large front teeth. On Friday, his father, Jesus Zapata, 42, stood next to his son's casket holding his bible. With three other men, he helped lower the coffin into the ground. His quiet sob turned into open crying as workers covered the coffin with planks, preparing the grave for the next inmate to be placed on top. Associated Press writers Fabiola Sanchez in Caracas, Venezuela, and Christine Armario in Bogota, Colombia, contributed to this report.